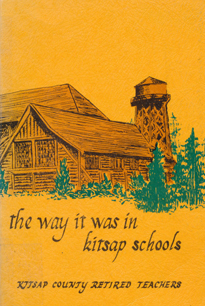 The 500+page book The Way It Was in Kitsap Schools: Memoirs of School Days in Kitsap County (1977) is a collective effort by Kitsap's Teachers Association to record and preserve the memory of the local school system as it developed from the 1850s onward. The project, encompassing all of Kitsap County, involved many contributors and hundreds of hours of interviews and research. Numerous photographs of schoolhouses, teachers, and students, enrich the stories. The book is available through the Bainbridge Public Library local authors collection.